I'm in town for the Finger Lakes Wine Festival. Touring and tasting at the wineries and at Watkins Glen International Speedway. 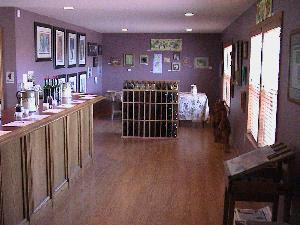 First stop, on Friday afternoon was Silver Springs WInery. 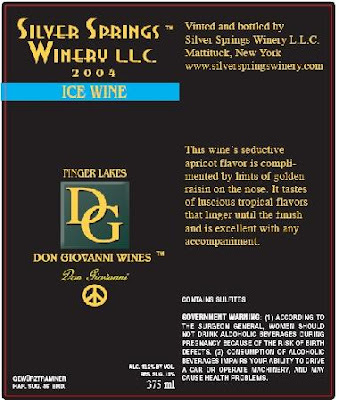 Silver Springs is a small winery based on the eastern slope of Lake Seneca. It is owned by John and Sari Zuccarino. According to their website, "The Zuccarino surname originates from Udine, a community in northeastern Italy, found above Venice in the Friuli Venezia Giulia region. The family ascended to the ranks of Nobility in 1320 C.E., when thereafter several Count Zuccarino’s emerged, helping to shape Italy. The legendary family passion for fine wine and vineyards has been passed down from generation to generation." Go to their website, and you can see John on his downloadable videos. Very cool. I knew none of that as I walked into the winery. I was not sure what to expect. I was greeted by John and Sari, who were both very polite and charming. I tried first their chardonnay, which was very lovely. Steel tank fermented, it was fruit forward with a nice finish, showing balanced acidity. Then I tasted all four of their reds. 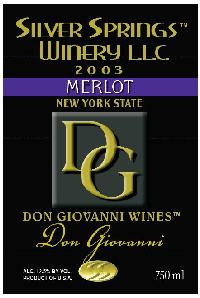 The 2003 Merlot was very nice, with bright cherry and some other red fruits. It ended with a smooth, dry finish - excellent. Both the Cabernet Franc and the Cabernet Sauvignon were also extremely nice. The Franc had a wonderful nose, and their were nice dark fruit foward flavors in the Cabernet Sauvignon. However, it was the last two wines that wowed me. The Bold Merlot 2003 was a stunner. Aged in oak for more than 2 years, it had big, big fruit up front - plum, blackberry - as wells as chocolate and a touch of pepper? Nice finnish. An excellent wine. I bought a bottle of that! And then I ended with a "sticky" as my brother-in-law likes to say - an exceptional Ice Wine Gewurztraminer 2004. A thick, honey, apricot, pineapple nectar, the winery was balanced by great acidity, making it one of my new instant fvorites among dessert wines. These folks, formerly from New Jersey (near my current haunt, Freehold), make some very nice wines across the board and instantly make their presence felt as a winery whose wines need to be taken seriously. A wonderful find! Congrats and good luck to John and Sari. Great wines! p.s. to John - my Grandfather, Ceasar, was from Udine too! He's buried there. Ciao! HUDSON VALLEY WINE Magazine Debuts! New Hampshire is Wine Country Too! !